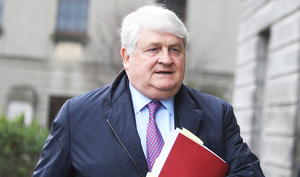 Today in the High Court, Paul O’Higgins SC, for Denis O’Brien, is continuing to cross-examine the former business editor of the Sunday Business Post Tom Lyons. Judge Bernard Barton told the jury at the outset of this morning’s proceedings that it’s likely he will give them their instructions next Wednesday. 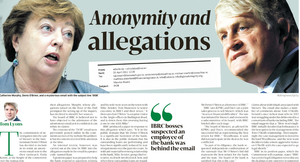 Mr O’Higgins told Mr Lyons that he wanted to go through the details of the SBP articles – spread over six pages and about a November 2008 PwC report on Ireland’s biggest borrowers – from March 15, 2015. In respect of page one, Mr O’Higgins asked Mr Lyons about his and his then editor Ian Kehoe’s decision to write the strapline ‘Confidential: The files they don’t want you to see”. He put it to Mr Lyons that, according to the SBP, the “they” was supposed to be a reference for “the Government”. Mr O’Higgins asked if that was the SBP’s position, why didn’t they “say that”. Mr O’Higgins asked why they didn’t make the word “confidential” smaller and write “The ‘Government’ files they don’t want you to see”. Mr Lyons said they thought their headline sufficiently represented their story. He also said it was “clear from the articles” who commissioned the PwC report – the Government. Mr O’Higgins put it to Mr Lyons that there was a serious crisis in September – before PwC could do a full evaluation on what Ireland’s bank securities were worth. He put it to Mr Lyons that the Government considered that it had to “move”. Mr Lyons said the Government “didn’t have a full picture of what was going on” until “suddenly one day” they realised that Anglo Irish Bank was “within hours of going under and other banks were close behind it”. Mr Lyons said then, on September 30, 2008, night of the bank guarantee, with “very unclear information” the Government decided that the entire country would guarantee the banks. Mr O’Higgins put it to Mr Lyons that this was “potentially a very costly thing from the Government’s point of view”. Mr Lyons agreed and said Ireland guaranteed something like €440million. Mr Lyons agreed with Mr O’Higgins that people were being told this was a “liquidity problem”, as opposed to a “solvency problem” and that “the banks were grand”. But he said “more sophisticated” people knew more than the public. He said, as an example, businessman Dermot Desmond, wrote a letter within weeks of the guarantee saying “this guarantee isn’t going to solve this” and that the problem was greater than everyone thought. Mr O’Higgins recalled a RTE Prime Time interview given by the then Financial Regulator Patrick Neary who told those watching that “Ireland’s banks were the best capitalised banks in the world or Europe”. Mr Lyons said he remembered it and how it sent out the message “everything is grand”. Mr O’Higgins suggested to Mr Lyons that there was “significant scepticism” surrounding this at the time. Mr O’Higgins said, following the guarantee, “most banks recovered briefly and then began to fall again”. Mr Lyons said he wouldn’t say Anglo Irish Bank recovered. 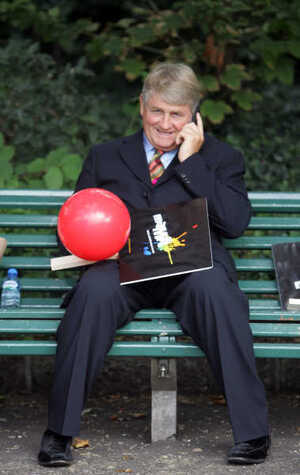 He said “they were fiddling the books” and recalled how the lender was “getting €7billion from Irish Life & Permanent”. He also mentioned there had been subsequent convictions in respect of this. Mr O’Higgins suggests that the newspaper’s articles main focus was on Anglo Irish Bank. Mr Lyons disagreed and said there might have been more focus on Anglo Irish Bank and Bank of Ireland but this was because they were bigger banks. He said, for example, EBS was a smaller entity so there was perhaps less coverage about it. Mr O’Higgins put it Mr Lyons that a lot of information about the banks was known publicly in 2012 – and that a lot was actually known from 2009. Mr Lyons asked him to specify what information he was referring to. Mr O’Higgins said he was referring to “issues in relation to the fact the banks were in much more trouble than they thought” and that “there had been a series of peculiarities in Anglo Irish Bank”. Mr Lyons indicated that the detail in the PwC report about which he was reporting – and, by extension, the Sunday Business Post articles – wasn’t known. Mr O’Higgins asked Mr Lyons if he believed everyone “dutifully reads all their Sunday papers from beginning to end”. Mr Lyons said for a paper like the Sunday Business Post, which tends to be read by people who are in business, he suggested they would. Mr O’Higgins put to Mr Lyons that this was “interesting” and asked “so it wouldn’t matter” what page a story was placed on – front page, back page, etc – “because it’s all going to be read”. Mr O’Higgins put it to Mr Lyons that the hypothesis of his articles was that the PwC report “painted everything in rosy terms when it was nuclear”. Mr Lyons said, based on his reading of the report, it painted Ireland in “big trouble” and that it stated Ireland could lose €10.6billion. Mr O’Higgins put it to Mr Lyons that he was saying that the PwC report “wasn’t worth the paper it was written on”. Mr Lyons replied: “No, it was clearly worth something.” Mr Lyons said what the report was, was “overly optimistic”. 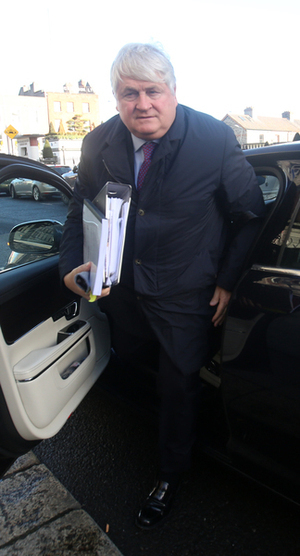 Mr O’Higgins put it to Mr Lyons that either he was saying the then Taoiseach Brian Cowen – in November 2008 – was “well warned and used the PwC report to tell the truth to the Dail” or he was saying “PwC came nowhere near to describe to the scale of the problem”. Mr O’Higgins told Mr Lyons he “can’t have it both ways”. Mr Lyons said the PwC report did come nowhere near the scale of the problem and that this is clear because of the subsequent €64billion EU/IMF bailout. Mr O’Higgins raised the fact that the PwC report identified five high-risk borrowers. Mr O’Higgins suggested that the point of the SBP articles was to suggest it was “ludicrous” to identify five when it was clear these people “nuked” Irish society. Mr O’Higgins asked Mr Lyons if he believed PwC was “right or wrong” to identify five high-risk borrowers. Mr Lyons told Mr O’Higgins, rightly or wrongly, the PwC report did identify five high-risk borrowers. Mr O’Higgins put it to Mr Lyons that he had a degree in history and economics and asked if he could understand his question: was the PwC report right in identifying “only” five high-risk borrowers. Mr O’Higgins quipped that Mr Lyons might “not get a fifth journalist of the years award” if his language skills drop. Michael McDowell SC, for the Sunday Business Post, told Mr O’Higgins there was “no need to be rude”. Mr O’Higgins asked the question again. Mr O’Higgins asked when he [Mr Lyons] said it was wrong that there were “only” five borrowers in the high-risk category, was he saying this was right or wrong. Mr O’Higgins asked Mr Lyons why did he “waste so many words” and not just say “PwC identified five high-risk borrowers” as opposed to “PwC only identified five high-risk borrowers”. Mr Lyons said it was a matter for the jury. Mr O’Higgins asked Mr Lyons about his use of the term “telling and disturbing” when he was referring to the numbers contained in the PwC report and the “individual stories”. He asked Mr Lyons why the numbers were “telling and disturbing”. Mr Lyons said because the numbers were “very big” and that it was “disturbing” that anyone would owe so much money to a State-owned bank which had been “nationalised, had committed fraud, and had cooked the books”. Asked about the “individual stories” being “disturbing”, Mr Lyons said it was disturbing to think anyone would owe very large amounts of money to a bank which had been nationalised, committed massive fraud and “had essentially been shown to have lied left, right and centre”. Mr O’Higgins asked Mr Lyons if he was saying it was “disturbing” to owe money to Anglo Irish Bank. Mr Lyons clarified he wasn’t speaking about “every borrower” from Anglo Irish Bank”. Mr O’Higgins put it to Mr Lyons that much of what he had reported in the Sunday Business Post articles of 2015 was in an article he co-wrote in the Sunday Independent in 2012 with Nick Webb – about Anglo Irish Bank’s top 13 borrowers. Mr Lyons said not all of the 13 people in the Sunday Independent article made it into the list of 22 drawn up by PwC. He mentioned Paul Coulson as an example whom Mr Lyons said was “like Mr O’Brien a successful, respected businessman”. Mr O’Higgins asked Mr Lyons “what was wrong with his [Mr O’Brien’s] borrowings from Anglo?”. Mr Lyons said from the public’s perspective Anglo Irish Bank was a bank which had been nationalised and committed fraud. He said that was “disturbing”. Mr O’Higgins put it to Mr Lyons that yesterday Mr McDowell SC, for the Sunday Business Post, asked him [Mr Lyons] if his articles were defamatory and Mr Lyons said no. Mr Lyons said what happened in Anglo Irish Bank wasn’t Mr O’Brien’s fault. Posted in Misc and tagged Denis O'Brien, Sunday Business Post, Tom Lyons at 3:29 pm on February 14, 2019 by Bodger.